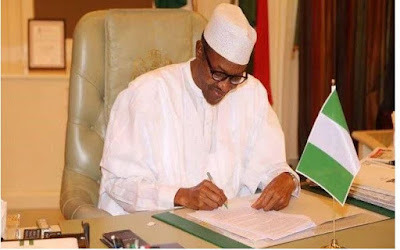 President Muhammadu Buhari on Tuesday, October 02, 2016 sent a draft of the 2017 Budget to the upper house of the parliament for approval. The 2017 budget draft detailed plans to spend a record of 6.86 trillion naira ($22.57 billion) in an attempt to pull Africa’s biggest economy out of recession. Naira to the U.S. dollar. be approved by the Senate before the final budget for next year is submitted. It could be months before a final budget is passed into law. wrangling between the government and Senate. million barrels per day (bpd) at the start of 2016, by 700,000 bpd. at a price of $42.50 per barrel. about planned OPEC output cuts. investment in its power, road and rail network. the second quarter of this year. August, is “expected to moderate to 12.92 percent” next year.